Another painting from BYO at PAULNACHE. 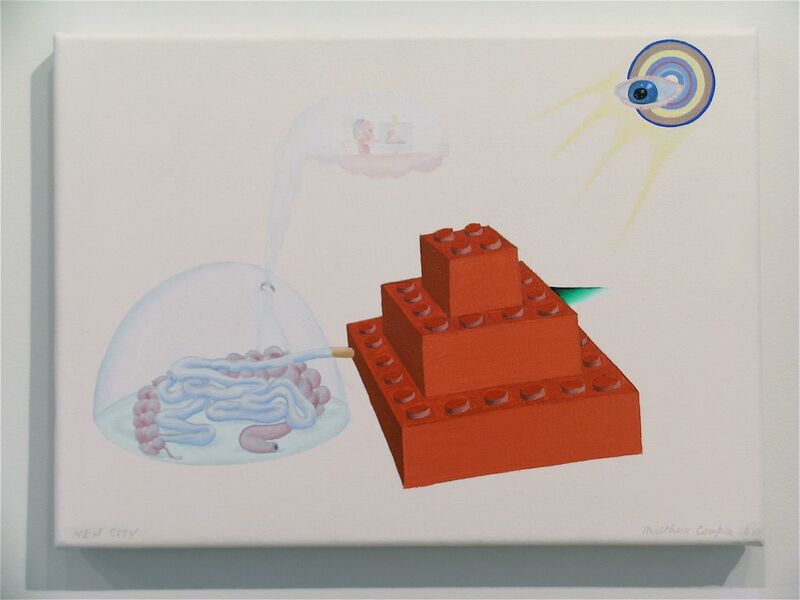 This painting, titled New City (2004/5, oil on linen, 300mm x 400mm) shows a grouping of life and painting influences: Lego, Renaissance painting and Philip Guston (in the faint thought-bubble about the Lego blocks). The dome with the intestines on the left hand side, I see as a symbol for processing the influences to make into symbols, a meta-symbol, I guess. I started painting on a white backdrop as it was something I experimented with at art-school that seemed to challenge the composition by making the symbols so stark and direct on the canvas. Many of the paintings previous to this group were painted on a black backdrop, which created instant mood, something that became too easy to achieve and wasn't enough of a challenge. It's incredibly hard to create a dark mood out of a light backdrop.